Pictures can help young readers remember story details. 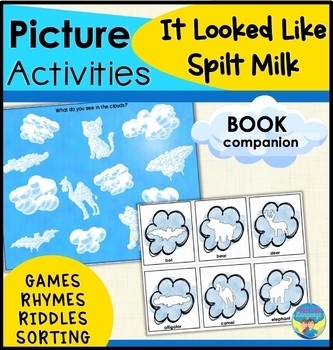 This activity packed book companion set includes multiple games and sorting/matching activities. This early literacy set also works on riddles, rhyming and vowel skills. Differentiated instruction for mixed groups is made easier with varied levels of activities and choices of pictures, words or both! The book, It Looked Like Spilt Milk, must be purchased separately. 1- Sort what was/was not seen in the book. 2- Find animals in the cloud scenes. 3- Play the riddle card activity. 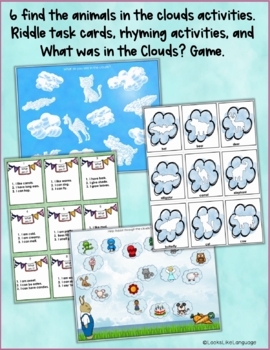 4- Play the printable cloud board game. 5- Sort what goes up or down. 6- Sort pictures by vowel sounds. 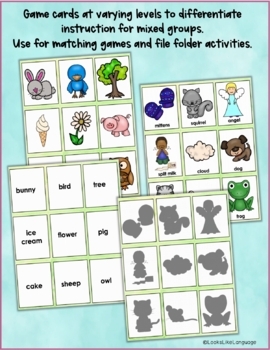 9- Match the shapes in a file folder activity. * Great visuals to go along with the book and fun for the kids. Thank you! 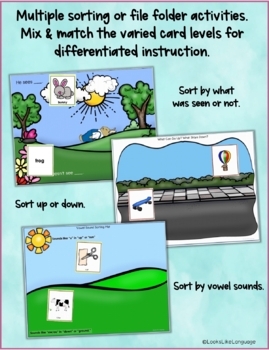 * I loved this...it really helped me out with my observation in sequencing events. • Book Companion: Remembering Story Details- "Goodnight, Owl"